CONGRATULATIONS!!!! to the new HOTB officers elected at the April Quarterly meeting held at the home of Peter Reid. So feel free to come out to any of the events, and say hello to the current and officers elect. The new board will officially take over July 1st, and the current officers will help with the transition process till that date. We ask that you support these fine guys as they bring new and fresh ideas to the club…they will really appreciate it….and I know they will do a GREAT job. I also want to take this time to thank all of you for supporting the current board over the past year, and it is our hope that we have served you well. We have had a fun time and hope you have too. We have many events coming up in the next few months and hope that you are able to attend. 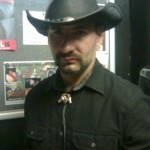 UNRUN 7, Lonestar 23, the Anniversary Party, Pride just to name a few. So come on out, bring a friend, enjoy a good time with your Bear brothers. 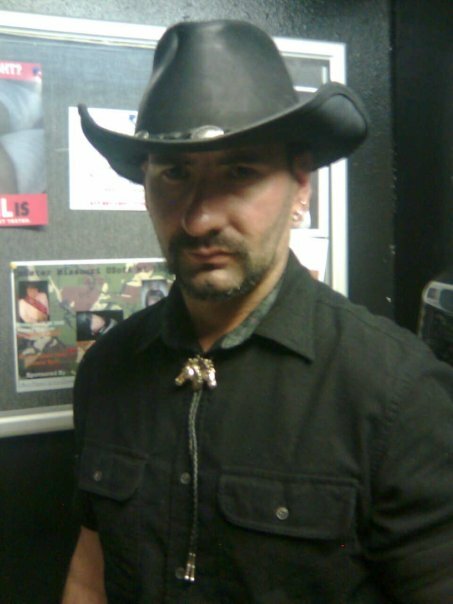 Its about to heat up here in Austin….and I’m not just talking about the weather. SXSW will celebrate its 25th Anniversary this year, and its expected to be one of the biggest ones yet. With it there will be LOTS of people from out of town descending on downtown and the surrounding areas to enjoy what we sometimes take for granted….a vibrant city full of live music, restaurants, clubs, art, and multitude of things to experience. That’s what I love about this city…there is ALWAYS something going on here, and there is ALWAYS something to do. And speaking of things to do, we have an event coming up that not only helps celebrate what Austin has to offer, but helps raise money for some very worthy causes. I’m talking about UNRUN. This year will be our 7th year of helping keep Austin weird, and raising money for OUT Youth and the People’s Clinic at the same time. Its sure to be a great weekend, so be sure to join us April 29 – May 1 at any of the scheduled events. 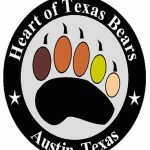 For more information go to http://heartoftexasbears.org/unrun. Bring a friend!!!! 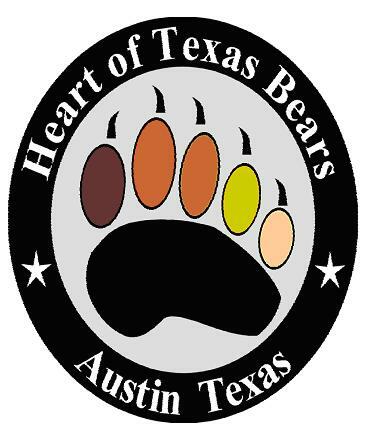 WELCOME to all our newest HOT Bears….and many THANKS to all of you who continue to renew your memberships. THANK YOU! After the recent cold weather, I for one am glad to see the return of warmer temperatures. Not only is it time to get into the garden, work around the yard and house, it’s also time to start thinking about the various runs coming up for 2011. IBR is being held in San Francisco in the next couple of days and for all of those who have not heard, this is the last one. For those of you who have attended past IBR’s over the years, I know you have many fond memories and have made many good friendships as well. LUEY weekend, hosted by the Houston Council of Clubs, is just around the corner, as well as TBRU in Dallas, Lonestar 23, and many many more. A little bit of something for everyone to be sure. 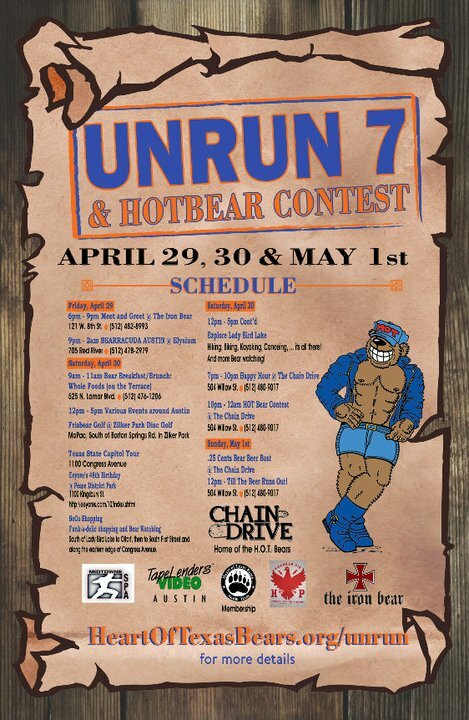 And not to be left out of all the fun, the HOT Bears will also hold its own run called UNRUN 7. This is our annual charitable fund-raising event, and is being held April 29th thru May 1st. Last year’s run was very successful, raising $2000 for local charities….all while having a great time too. This year we have many great volunteers who are helping plan the many events and activities for what we hope is our biggest and best UNRUN to date. And as a very special event….we would like to announce that BEARRACUDA will help kick off UNRUN immediately following the meet and greet on Friday! We still have many opportunities for members who want to help out and volunteer during the weekend,…so contact any of the officers today to see how you can help out. If runs are not your thing, remember we still have many other opportunities for you to hang out with fellow members, and make new friends. The first breakfast has been picking up since moving back to Trudy’s and the movie nights have been really fun too….as well as the many other events we host each month. And as always, we are open to new events and opportunities to hang out, so if you have suggestions we want to hear them. It’s a new year for us here at the HOT Bears and we hope it will be a good one…not only for the club (so far so good!) but you as a member as well. 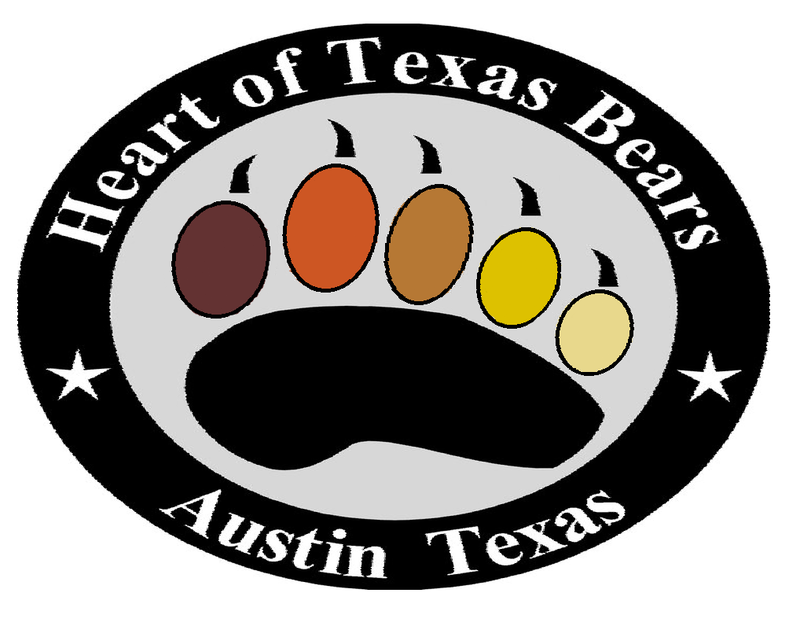 It is with this hope that we make a fresh commitment, not only to ensure plenty of fun events for you to enjoy, but that your membership in the HOT Bears is a value to you. 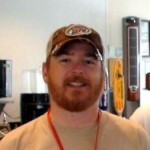 We are currently working on ways to improve existing events (beer busts, UNRUN, etc…) and add new ones. One area we really want to work on this year is adding more home based events, such as movie nights, game nights, cookouts, and the like. We realize that bar related events aren’t everyone’s cup of tea, and eating out can be expensive. So we would like to have more opportunities where the group can meet up at peoples homes (or other venues), get to know each other, and create those long lasting bonds where friendships are made. We have had really good response to this and the last couple of events have been well received. So if you have a place and want to host a get-together….let any of the officers know and we can work with you to make it a fun time. Even if you don’t have a place but know someone who does, and still want to co-host an event…we can work with you as well. We look forward to the upcoming year, and we want to make it a really good one. With your help and support, we know that its possible. And as always, remember….this is YOUR club…and YOUR input is important to us. Here’s to 2011…..let’s get started. Is it just me, or does it seem like 2010 has flown by? It seems as though we were celebrating a new year just a few months ago. I guess that happens when you get older…LOL. This last month or so has kept us here at the HOT Bears pretty busy…a late summer pool party (THANKS Joe and Tom), the usual bear events, and of course Back To The Woods 6 (B2W6). If you did not make this years camp-out, you missed a really good time. The weather was PERFECT! We had 131 registered attendees, with many of them being first timers too! The show was a HOOT with many laughs and new performers. (FYI…we will watch the DVD of the show at this years Holiday Party…so make sure to be there for that.) There were also fond remembrances too of Ed, Kiwi, and Richard…..who were greatly missed by everyone. Texas Redbud trees to commemorate their lives were planted in the Bear Garden so that all campers to TCC can enjoy the beauty and remember them as well. I want to take this opportunity to welcome all the new members that have joined in the last couple of months as well. It is our hope that as you get plugged in, you will get to know a new friend or two by attending one of the many events listed in the calendar (see link above).. After all, that is why the club was created. If you have any suggestions on events that you would like to see us do, please feel free to drop us a line, or catch us at one of the monthly planning meetings. They are open to all club members and your participation makes our club even better!